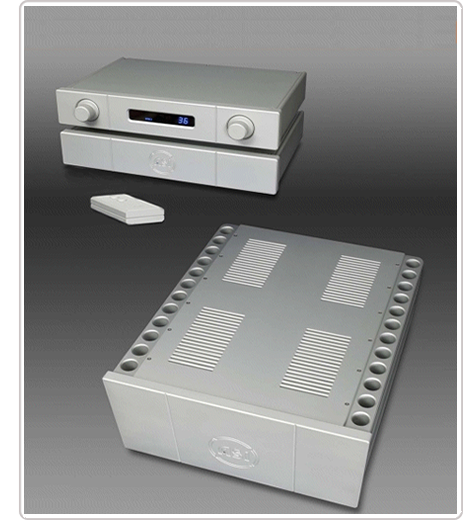 The Grand Mono is our reference statement amplifier. It delivers a crushing 2.400 watts into 8 ohms (3.600 into 4 ohms, 4.500 into 2 ohms) and peak current and voltage swing figures of 240A and 140V. Even so its reflexes are blindingly fast and frequency response is a very broad DC to 500kHz ±0/3dB. Damping factor for uncompromised speaker control is 10.000 from 20Hz to 20.000Hz and the signal-to-noise ratio is better than 120dB to keep up with today's high-resolution music material. Each monaural amplifier weighs 90kg (198lbs) and measures 505 x 630 x270mm WxDxH (19.9 x 24.8 x 10.6"). Rear panel provisions are two IEC power inlets, biwire terminals and XLR or RCA* inputs. *To use the RCA inputs, the provided metal bridges must be inserted into the XLR terminals. The matching Grand Stereo utilizes the same chassis but scales back power to 650 watts into 8 ohms, 1.000 watts into 4 ohms and 1.800 watts into 2 ohms. Its instantaneous peak current delivery is 120A and maximum swing voltage is 75V. Weight and dimensions are identical to one mono amp. Rear panel provisions are two power IEC inlets, RCA and XLR inputs and biwire loudspeaker terminals. The LiveLine twin-enclosure preamplifier offers three RCA and three XLR inputs and two XLR outputs. Maximum swing voltage is 18V RMS. Input and output impedance are 30K and 30 ohms respectively. Frequency response is a very wide DC to 600kHz ±0/3dB. Channel separation is <120dB and the A-weighted noise floor is <130dB. Maximum power consumption is 60 watts and the unit operates at up to 40°C in room (internal temperatures may approach 60°C).